Welcome back to ESRM! We’ve had an eventful summer that has seen a ton of great work by ESRM faculty and students from Ormond Beach to San Clemente. Perhaps one of the most conspicuous changes has been the loss of our program analyst, Mia de Paula (she’s started law school and moved over CSUCI’s Title IX office). For these first few weeks of the semester ESRM’s administrative needs will be supported by the Dean’s office. We are super grateful for their help, but everyone should be prepared for things taking a bit longer than usual over the early part of this fall semester. We are optimistic we will get a replacement program analyst, but these things can take some time. As usual, Dr. Anderson has several office hours each week, but has reserved his Tuesday 11-noon time slot in BTW 1265 to help you with major/minor advising and general career questions. While anyone can always drop in for a chat, sometimes this has translated into a bit of a wait as the line stretched out the door. 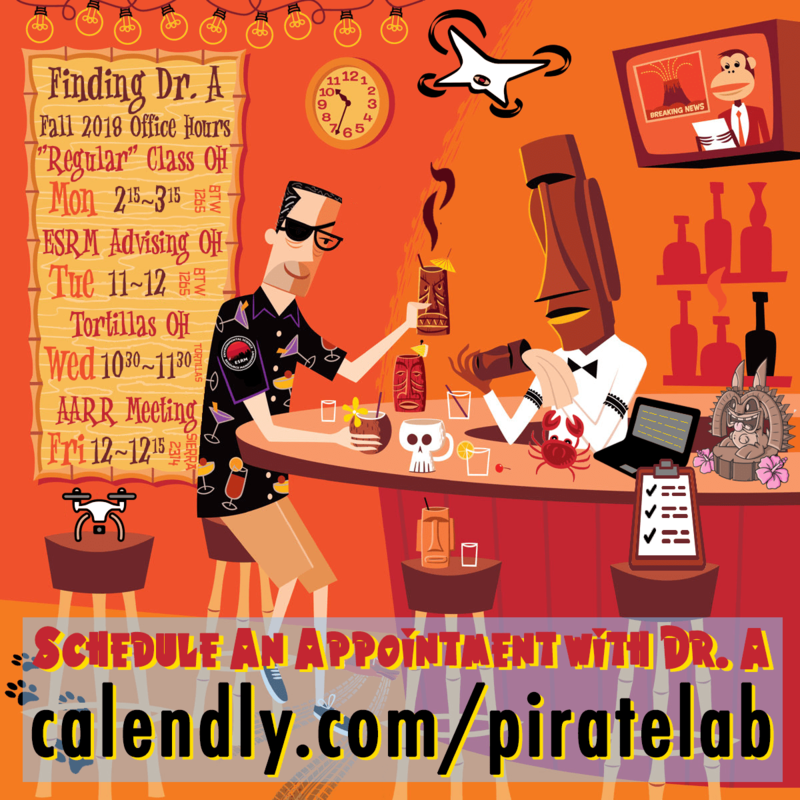 To make meeting with Dr. A a bit easier for you and simpler to confirm, he is piloting a new tool (Calendly) wherein you can schedule a meeting time via a simple web link or use the options below. We are also trying a new meeting this first week of the semester. 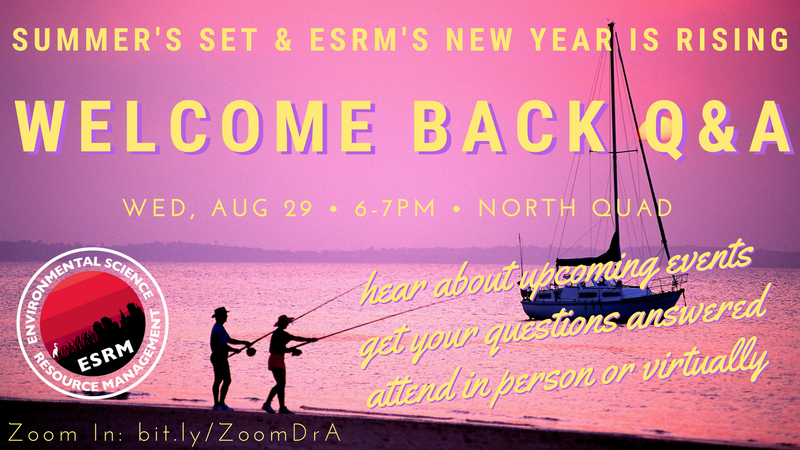 Everyone is welcome to our first ever ESRM Welcome Back Q&A session on Wednesday, August 29 from 6 to 7pm on the lawn in the North Quad. Everyone is welcome to come by to meet our ESRM faculty, hear about all the cool stuff coming up over these next few months, and hear about ways you can start getting involved with faculty-led research. Much of the meeting will be devoted to answering your questions and dispelling rumors (man, do we have a bunch of rumors) about your easiest path to graduation. For folks who can’t physically make to the North Quad, we will be webcasting the meeting via Zoom. All you need do it following this link starting at 6pm this Wednesday.